In this lively interview with Jill Malandrino of The Street, I discuss the importance of ongoing innovation and how we grew to 1,200 retail centers with sales of $500 million in just 15 years. We also talk about what has worked for Edible Arrangements®, customer feedback and what we are focusing on going forward. See the complete Tariq Farid interview here. In the earliest days of Edible Arrangements, before it even became an official tag line, I set out with one simple goal in mind: To WOW my customers. And that’s why to this day, I find it so gratifying to see franchisees who continue that tradition. One such franchisee is Rory Friedland, owner of our stores in Plainview and Port Washington, New York. Witnessing he and his employees, and the energy they put into WOWing their guests, really took me back to the beginning. In those early days, people didn’t even know who we were yet; they hadn’t come to fall in love with our product yet, as they were just hearing about it. People would ask about our company, and question our product because it was so new. It took time and dedicated customer service to win them over, and to ensure that the business would not only survive, but thrive. We guaranteed our guests we would WOW them, and offered to do whatever it took to achieve that end. I still remember what it took to win those early guests over, and how dedicated I was to WOWing them. I see that same dedication in franchisees like Rory Friedland and his staff. They are holding true to the original mission of Edible Arrangements, which is so near and dear to my heart. And I’ve seen this in Rory right from the very start, when we first got together to open his first store. Today, he’s a multiple-unit owner, and has never lost sight of that original spark. Rory’s hard work and dedication is commendable. And for that, I congratulate both he and his staff, and I thank them sincerely. I would also suggest that it is this very dedication to achieving that WOW that has helped make Rory the successful franchisee he is today. It can truly be said that a franchise is only as successful as its franchisees. I’ve always believed that hard work and dedication pay off—in fact, I’m living proof of that. 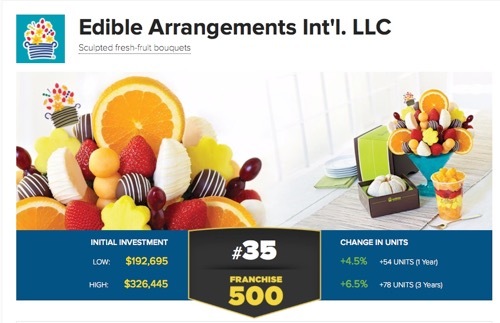 So when I see those qualities in our franchisees, it gives me great hope for the future of Edible Arrangements International. Each franchisee has their own story, and I never get tired of hearing them—in fact, we recently launched an entire website devoted to personally profiling our excellent owners: EAFranchise.com. We recently welcomed new franchisees to Lafayette, Indiana, with quite a heartwarming story of their own. Kathy and Jeff Good have brought their two families together, and are now putting their heads together to make their brand new franchise location the best it can possibly be. Kathy has a background in both the food service industry and the real estate industry—two worlds that have no doubt prepared her for much of what comes with getting established as a new Edible Arrangements franchisee. Her husband Jeff comes from a strong retail background, with more than 30 years experience. Together they have the kinds of tools that budding entrepreneurs need to succeed. But while business savvy and experience are certainly important, it takes more than that. You need a certain amount of heart and passion for the business. It takes a special kind of dedicated person. And I find that often those who bring great integrity, drive and positivity to their personal lives are the ones with the greatest chance of success. Kathy and Jeff first met in 2002, and they married four years later. By doing do, they also joined their families together, since they both have three sons each. They’re now raising five of those six boys together, as well as caring for Kathy’s grandmother, who lives with them. Kathy and Jeff are undoubtedly two people who know a lot about responsibility, but also undoubtedly know a lot about the satisfaction and rewards that comes from living up to responsibilities. With their two youngest boys approaching college age, Kathy and Jeff fully intend to make their business a family business, and plan to have all the boys pitch in as much as possible during college breaks. With committed parents like Kathy and Jeff leading the way, I have no doubt the boys will be happy to join in. Kathy and Jeff Good had been hoping to open their own franchised business for the past four years. After careful research, they finally decided on Edible Arrangements, and I’m very glad they did. I wish them tremendous success in their endeavor, and hope their family work ethic will serve as an inspiration to other franchisees, both current and future. When I first started Edible Arrangements® in 1999 in a corner of my flower shop in East Haven, I never dreamed that we would have over 1,100 locations in the U.S. and around the world. Like many entrepreneurs just starting out, my first and main concerns were having enough money to stay open and getting customers. Opening a store overseas never even crossed my mind. I was more concerned about keeping my first Edible Arrangements store open and making it a success. Well, what a difference a few short years make. Like many businesses, growth overseas is a tremendous opportunity to increase awareness of your brand and build your customer base. As a franchisor, opening your concept in a new country is daunting and nerve-racking. For me, finding the right partner to establish and build the Edible Arrangements brand in an international market is the most important decision I can make. Why? Well, I am entrusting the brand image, trade secrets and systems to someone to run with it –basically build the Edible Arrangements brand from scratch and introduce our products to a new market. One of the first international countries we entered was Saudi Arabia. The person who we sold the rights to open Edible Arrangements in Saudi Arabia is an amazing woman, Nourah Al-Roassais. The first time I met Nourah I knew we found the perfect partner to introduce Edible Arrangements in Saudi Arabia. She had so much energy, enthusiasm and passion –she had the “wow” factor we look for in our international partners. She had everything we needed to make Edible Arrangements very successful, and that is what she has done. She has far surpassed our expectations. I cannot say enough about Nourah. She is probably the most inspiring, courageous person I know, and she not only inspires me and all of us at Edible Arrangements, she also inspires her staff and everyone she comes in contact with. The word ‘no” or ‘cannot’ has no place in her vocabulary. Her positive attitude and can do energy grabs us all. What she has accomplished as a businesswoman and role-model in Saudi Arabia is awe-inspiring. Nourah is also a perfectionist. I’ve seen a lot of Edible Arrangements stores in the past 11 years. But I tell you, I have never been more blown away by the beauty and design of Edible Arrangements stores than when I visit Saudi Arabia and see Nourah’s stores. Only one word can describe her stores –phenomenal. I included just a few pictures of her stores in this blog for you to see. Nourah has pushed me –pushed all of us at Edible Arrangements -to make us better. Her only concern is making Edible Arrangements amazing. In three short years, Nourah has opened 11 stores and has built a tremendous loyal following. I know she will open many, many more successful stores soon, and keep giving us ideas that we can use to improve the system everywhere. I just have to let you know the effect she has on people. At the annual Edible Arrangements convention this August, Nourah received the international franchisee of the year award. When Nourah came up to accept the award she received the biggest, loudest standing ovation that I have ever seen at our convention, or anywhere else for that matter. Franchisees wanted their picture taken with her, as did I. She is a true rock-star in our world. Her story and what she has accomplished makes the obstacles that I and others had to overcome seem very small. Thank you, Nourah –for inspiring all of us and making all of us at Edible Arrangements want to work a little harder, fight a little longer and give us a little more –well, a lot more – motivation to just go out and make it happen.